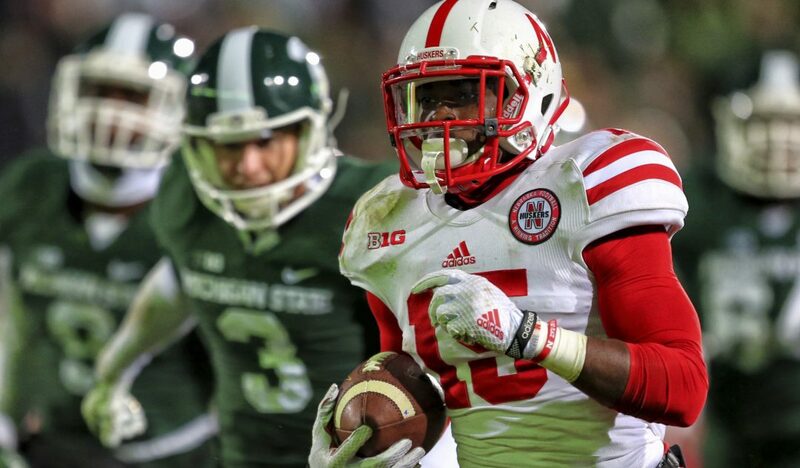 De’Mornay Pierson-El races 62 yards with a punt return for a fourth-quarter TD. NEB: A.Abdullah 24-45; T.Armstrong 11-7; TEAM 2-minus 5. MSU: J.Langford 29-111; T.Lippett 1-32; N.Hill 9-30; R.Shelton 3-22; TEAM 1-minus 1; C.Cook 1-minus 6. 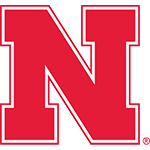 NEB: J.Westerkamp 9-158; K.Bell 3-31; T.Allen 3-9; A.Abdullah 2-22; A.Moore 1-43; A.Janovich 1-16; L.Hovey 1-8; D.Pierson-El 1-minus 5. MSU: T.Lippett 3-104; M.Kings 2-38; A.Burbridge 2-37; K.Mumphery 2-34; J.Price 1-21; J.Langford 1-0. NU scored three fourth-quarter touchdowns, then had the ball at the MSU 37 in the final minute with a chance to win. 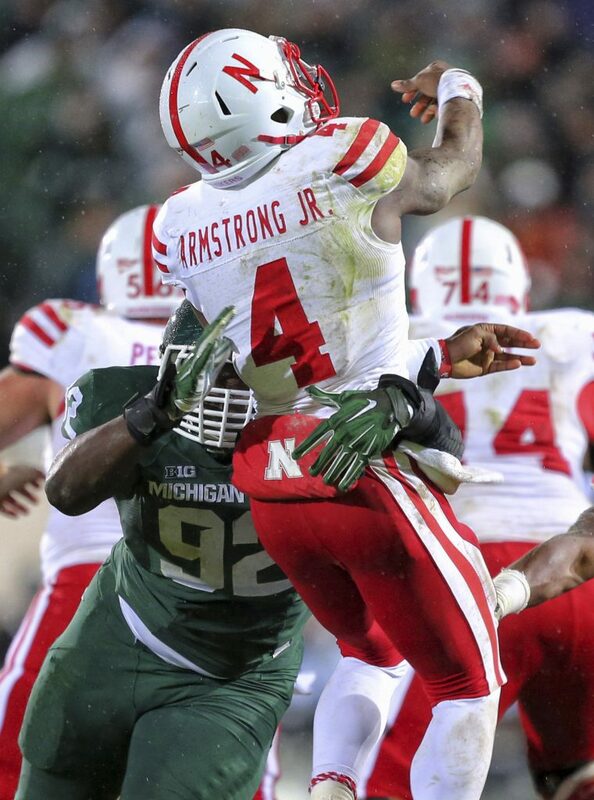 A near-completion in the end zone from Tommy Armstrong to Alonzo Moore was followed by an interception that sealed the win for Michigan State. De’Mornay Pierson-El scored on a 62-yard punt return with 3:22 left to help set up the late dramatics. Joel Heath pressures Tommy Armstrong in the second half. Nebraska’s offensive line was whipped in an alarming manner much of the night. All the old big-game bugaboos were rounded up like usual suspects in this one. I don’t think it’s unfair to have some questions about the team’s plateau point, or even if Nebraska has at least toed the edge of it. 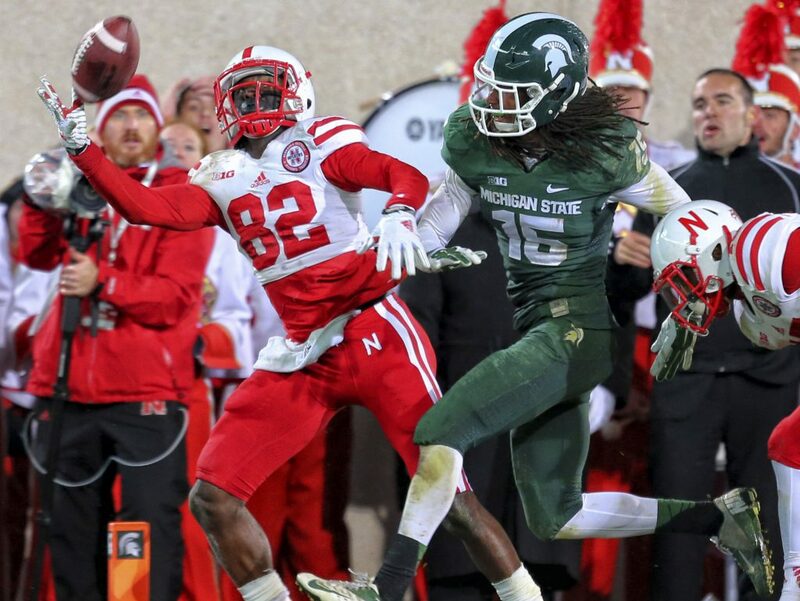 Nebraska’s effort on a chilly, dreary night in East Lansing was not only honorable, it gave some signs of hope. Nebraska’s late surge, if nothing else, added some juice if these teams have a rematch for the Big Ten title. Less than 40 minutes into this game, I was wondering if there was anything that could be salvaged from it for Nebraska. The positive you can take out of this is NU didn’t quit, when clearly MSU thought they might. While the Spartans ultimately won, it didn’t feel right. It wasn’t a triumph. It was a sigh of relief. The Spartans almost blew a magical weekend. An interception staved off collapse, and a grateful Dantonio felt relieved he wasn’t talking about that. This was dominance most of the time. A familiar form of it.